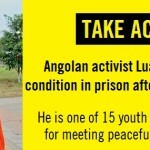 One year ago today, the initial arrests were made of a group of activists in Angola’s capital of Luanda. Dubbed the #Angola17, their crime was meeting to read a book and discuss non-violent methods to promote political change, primarily how to urge the government to expand civil and human rights. However, the Angolan government saw this as a threat, prosecuted them and convicted them to prison sentences ranging from 2 to 8 years. 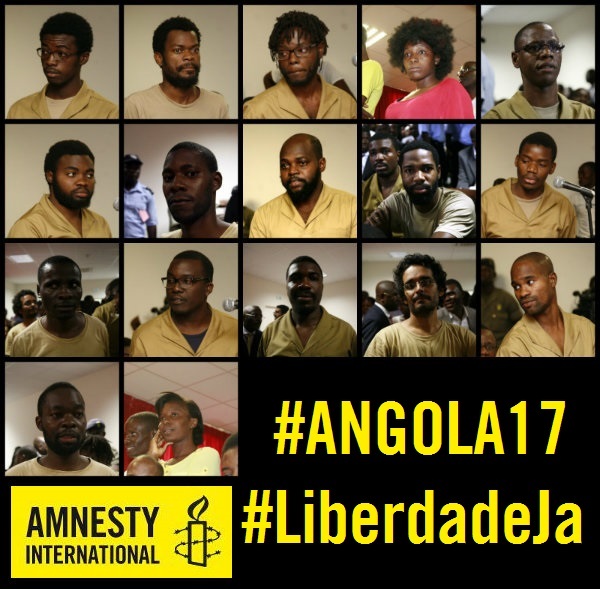 Amnesty considers the #Angola17 to be Prisoners of Conscience and today, we not only stand with them on the anniversary of their arrest, we stand with all Angolans who are uniting for a movement called Liberation Day. On this day, Angolans are demanding not only the release of the #Angola17, they demand an end to all politicized trials designed to silence activists. They demand respect for freedom of expression and assembly-the right to gather in public and express their ideas without being beaten or even killed by government forces. 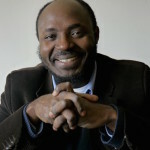 They demand an end to corruption and human rights abuses committed by the Angolan government. They demand their voices be heard. What can YOU do? Join us. Sign our petition demanding freedom for the #Angola17. Post a picture to social media wearing white with the hashtags #Angola17 and #LiberdadeJa. But most importantly, call the Angolan embassy in Washington DC and tell them you stand with all Angolans in demanding the freedom of all political prisoners and an end to corruption and human rights abuses. The embassy can be reached at +1-202-785-1156. People are organizing events all over the world today to stand in solidarity with Angolans demanding freedom and basic rights. Help elevate their voice by raising your own. LIBERDADE JA! 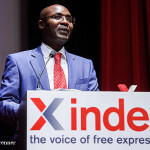 This entry was posted in Africa, Prisoners and People at Risk and tagged Angola, Angola17, Freedom of Assembly, freedom of expression, Liberation Day, LiberdadeJa, prisoner of conscience, Rafael Marques de Morais by Sarah Hager. Bookmark the permalink. Sarah Hager is a volunteer leader at Amnesty International USA, serving as Chair of the Southern Africa Co-Group where she guides the efforts of Country Specialists monitoring human rights in twelve countries. I am really amazed to see that finally this person has been arrested and the police has done a great job. The police has set the great example that has scare other people.